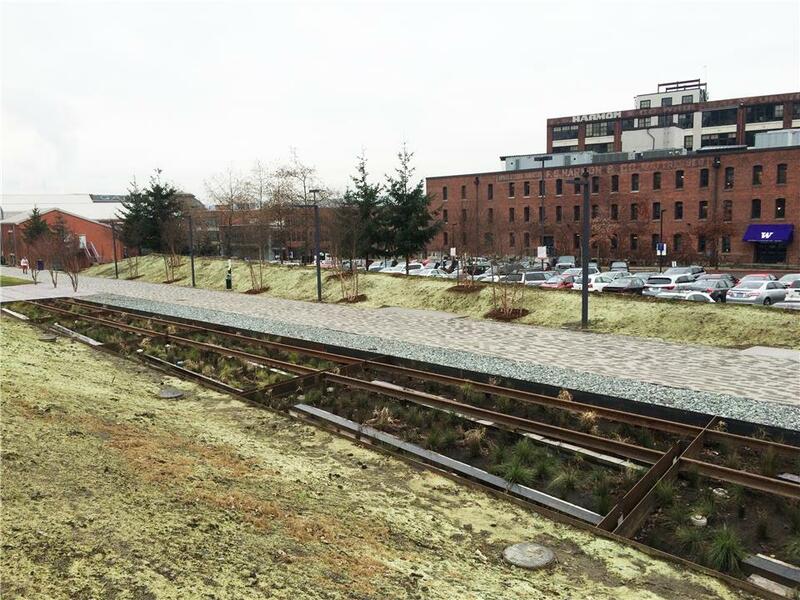 The City of Tacoma partnered with UW Tacoma and landscape architecture firm PLACE Studio to build a regional stormwater treatment facility along a beautiful bike and pedestrian trail beside a portion of the historic Prairie Line rail corridor. The rail corridor is historically significant as the first transcontinental railroad connection to the Puget Sound, which shaped the early development of the City. The project area falls within the Thea Foss Watershed, which drains into the Thea Foss Waterway and Commencement Bay. The Thea Foss Waterway has been monitored for a wide range of parameters since 2001. Despite the City’s intensive source control, maintenance, and education programs, data continues to show elevated levels of polyaromatic hydrocarbons (PAHs), phthalates, solids, and some metals. Therefore, this section of the City was targeted for treatment to further reduce contaminants to the Thea Foss Waterway. The University wanted a stormwater facility that could provide an interactive learning experience for students and the general public. To accomplish this goal the new facility features six, 550 square foot minimum custom Filterra systems with a specially designed flow distribution system to meet WA-Ecology design requirements. The Filterra systems filter stormwater through Filterra’s engineered media to an underdrain system that discharges to the City’s stormwater system, as infiltration is not feasible due to concerns about potentially contaminated soils. Since the site was previously a rail line, underlying soil quality is unknown, but areas within this vicinity have been known to include contaminated soils. The Filterra system was built within steel walls with a heavy membrane liner system with a heavy LLDPE liner adhered to the walls and lining the bottom. This prevents contamination from surrounding soils from migrating into the facility. The structural supports also support the railroad rails that were included as a visual reminder of the railroad that had once used the corridor. The system was filled with underdrain rock, piping, Filterra media, plants that assist with absorption of pollutants biological uptake/ storage and microbially-mediated transformations. A CDS hydrodynamic separator was also used to pre-treat a portion of the stormwater before entering the Filterra systems. CDS is a below-ground, flow-through treatment device that uses multiple treatment processes including swirl concentration and continuous deflective separation to screen, separate and trap debris, sediment and hydrocarbons from stormwater runoff. The Prairie Line Trail at UW Tacoma Station opened in September, 2014. An informational sign that includes a cross section of the treatment process is located adjacent to the facility.